In our previous post “12 Cool Wall Planters for Urban Dweller“, we showcased some cool planter which you can hang from the wall. However, if those wall planter aren’t something you can easily placed in the home, a nice table planter is always a good option. Different from the planter used in garden or hang from wall, table planter usually is more than a planter, it also servers a function as table decoration. 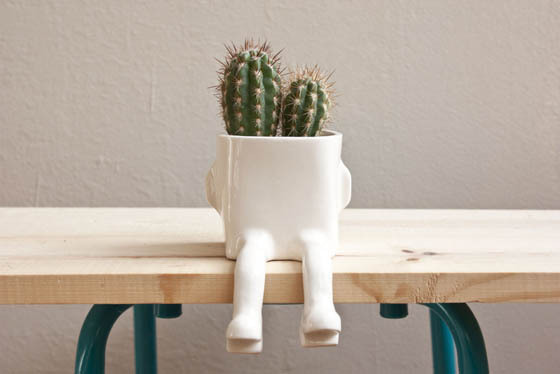 That is the reason there are more cute and creative table planters on market. Here, we rounded up 8 our favorite ones, which will not only bring a splash of green to your table but also an eye-catching decoration. Do interior plants dream about raindrops? 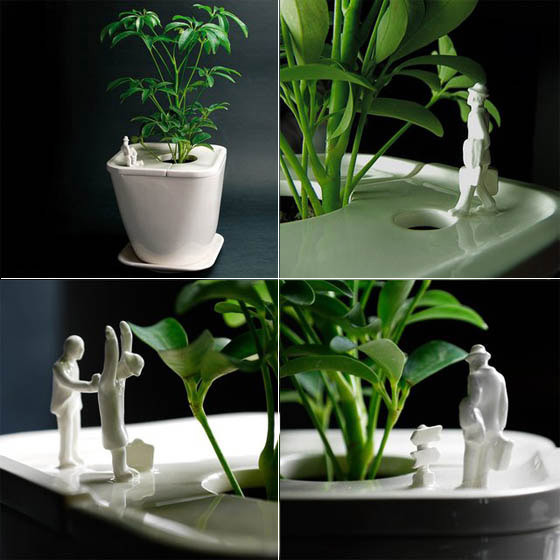 That’s what Korean designer Jeong Seungbin from DailyLife Lab thought, as it’s the nature’s intended way for plants to receive their water dose, so he created this supercute Rainy Pot. 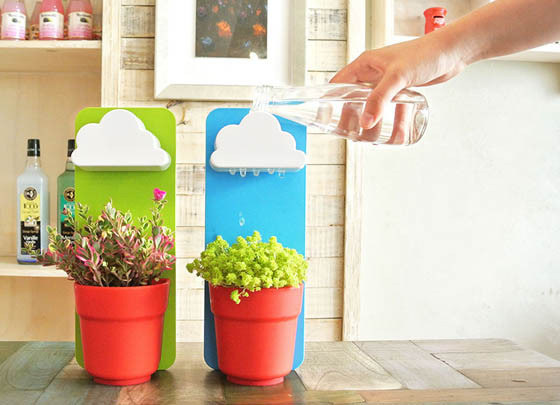 This clever and nice planter consists of a little pot and a cloud above it, which works as watering system. You just need to open the lid on top of the cloud and pour about 80 ml. of fresh water for your plant, and after that you can enjoy seeing the “rain” falling in your now probably happier flowers. Also, the pot has a little plug on the bottom that you can pull to let go overflowing water. Simple and functional! Based on the ancient Japanese art of Bonkei, a micro landscape of foliage, There are four versions to choose from: hiroba (which means “square” or “plaza”), roji (“alley”), zigzag or tunnel. 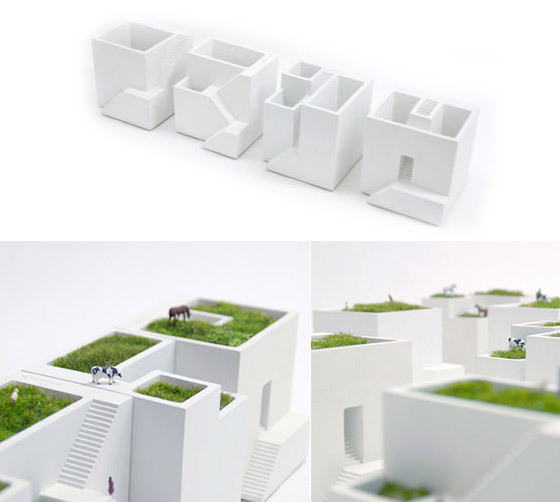 Or you can get all four and create a scenic miniature “town”. Ideal for planting and growing small foliage like moss. Flaneur’s Pocket is a collaboration between Brooklyn-based artists Lauren Manning and Veronica Acosta, friends who decided to merge their experience in architecture and design to make something fun together. 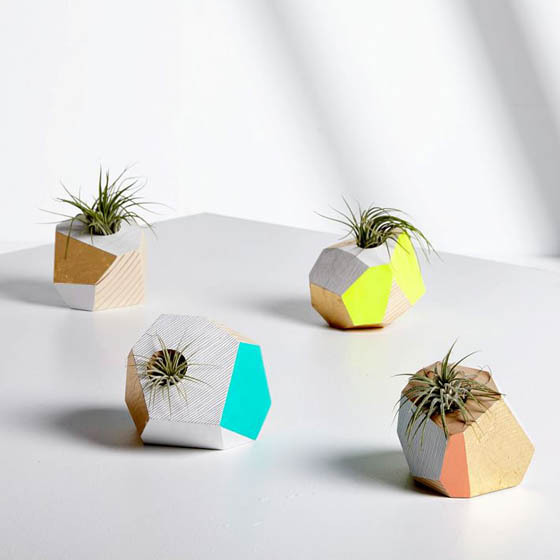 To create these Geometric Wooden Planters, Veronica hand-cuts, shapes and sands the wood into a unique form, and Lauren develops the color palettes and hand paints each of its facets. Each comes with an air plant—we love them clustered on a windowsill for a low-maintenance, high style indoor garden. Ceramic pot modeled and decorated by hand. Ideal to place potted cactus or culinary use small plants as mint, basil, thyme… With no drain hole, can place small stones and use a little water. These potted planters were designed as a backdrop for an urban park scene. This is a series of park scenes that explores the romantic side, as well as the dark side, of the park-the stuff that happens when the sun goes down and you’re not supposed to play in the park any more. Beautifully crafted out of porcelain each set contains a plate, the planter base and two parts of the lid, one blank and one with the scene of your choice. Animal farm. 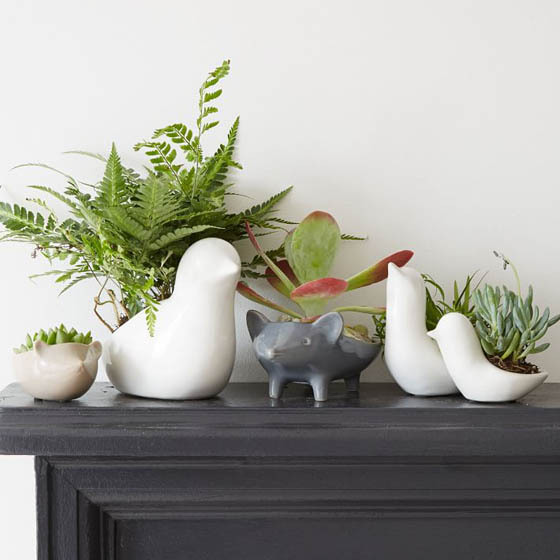 These Ceramic Animal Planters are designed to hold small succulents and kitchen herbs. If you’re not a plant person, they’re just as suited to holding soap in the bathroom or collecting coins on a console. 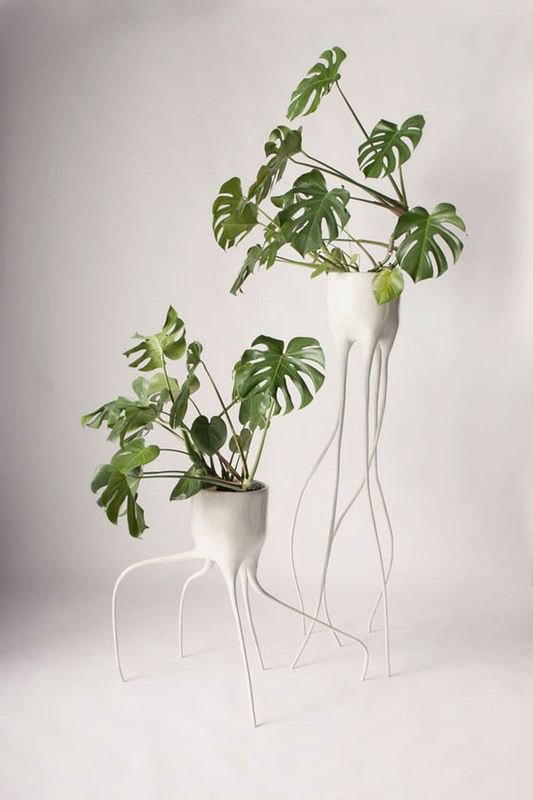 Designed by Tim de Weerd, the Monstera-plant pot has long ornate roots that extend downwards from the main container up top. Bent by hand, the organic-like roots are covered with epoxy clay and finished with a thick layer of white, high gloss lacquer. The result is a design that looks fragile but is unexpectedly strong and stable. 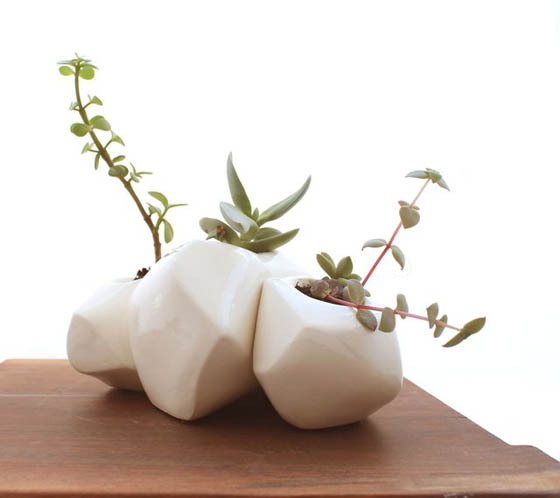 This set of three succulent planters are made of hollow porcelain with a clear glaze. They have holes for drainage in the base of the cavities, a rubber plug in the bottom of each planter in case of over watering as well as felt dots to keep your surfaces dry and scratch free. They measure 5.5″ x 3.5″ X 3.5″, 5.5″ x 3″ x 3.5″ and 6″ x 4.5″ x 4.5″.